We all know relationships matter––whether with our colleagues, friends or family. We also know that in international development relationships inside an organization or between organizations can mean the difference between smooth flying and turbulence when implementing a program. So, how do we make sure that we are able to leverage relationships in our work instead of being buffeted by them? A social network analysis (SNA) is one tool that is gaining popularity because of its ability to help practitioners track and understand relationships at a variety of levels. If we want to understand the extent and type of social relationships we are operating within, then conducting a social network analysis can provide necessary insights. The design, implementation and evaluation of development programs is intrinsically about people, institutions and the relationships between them. For instance, a social network analysis can help you understand stakeholder relationships and answer questions such as: Who is the most critical to share, spread or disseminate information? Who is the most influential or connected to the most individuals? Who acts as a bridge between different parts of the network? The benefit of an approach like SNA is that its methods can describe both simple and complex environments, with anything from a local community to a nation state. They also can range from the analog (in-person mapping exercises) to the most sophisticated (quantitative measures of individuals and the network). Program learning to provide information to adaptively manage program as it is implemented. It is critical to be clear about the type of questions you feel are most critical to your program and how you plan on using the findings from the SNA to inform your intervention - in software engineering, this is called the ‘use case’. Think about how you will ethically use the information for program design and implementation including monitoring, evaluation and learning purposes. Program context should influence the exact SNA approach and method. Sometimes simpler is better. Once you have determined the use case, you should select the approach and method that will capture the amount and type of data you can easily collect and analyze. 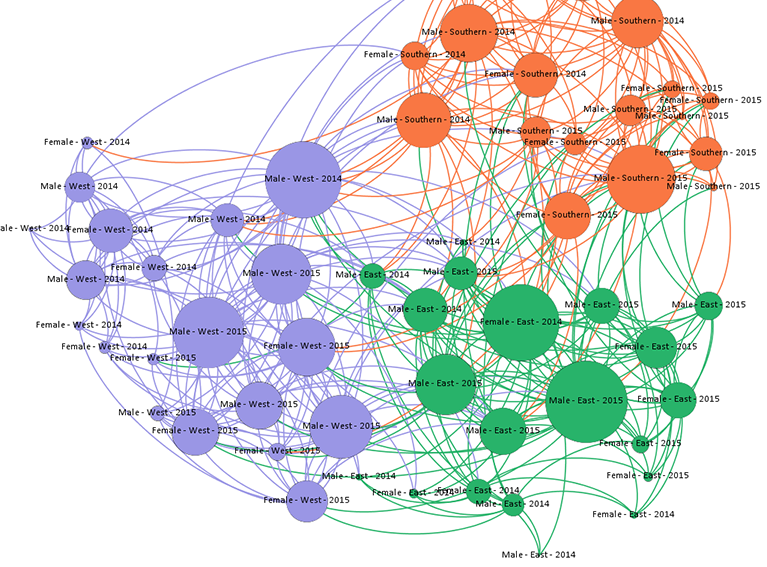 There is a variety of techniques ranging from low-cost analog, such as netmapping or collaboration mapping, to more sophisticated analyses that use metrics, such as free platforms such as NodeXL, UCINET or R, to paid platforms such as Kumu. The choice of platform will likely depend on the nature, frequency and type of data you will collect. Some programs will benefit from SNA more than others. SNA can be used across a range of sectors, from economic growth to governance but it is more easily integrated and used in programs focused on network-level or system-level change. Interventions where SNA may be the most useful include external advocacy, policy, communications and messaging along with programming focused on organizational development. Security, privacy and ethical considerations are paramount. SNA data has specific privacy concerns that other types of statistical survey data do not. For instance, data about relationships in general can be sensitive and any analyses could also reveal wider connections which may also be sensitive. Although it can be aggregated to a higher level, SNA data is often hard to anonymize. It is therefore critical to ensure good data practices by including fully informed consent and an opt-out option when collecting potentially sensitive data. You should also be transparent about how you will collect, analyze and report on the data. In addition, given its sensitive nature, maintaining appropriate data security collection and storage as well as deletion practices is paramount. Before deciding to use a SNA approach you should assess the situation, the alternatives and implications for the participants to ensure you are using the approach in an appropriate and ethical way. Supplement data, co-interpret and analyze. SNA findings are only as good as the data that goes into them. It is important to take stock and interpret the findings, especially if the analysis is quantitative. For example, if you are using SNA to understand changes in a particular network over time, it is often critical to interview the same people; this is often less important for larger quantitative surveys. In addition, it is important to supplement any SNA analysis with qualitative data to ensure that your understanding and interpretation of the data is accurate. Often the best way to do this is to let people from within the network explain to you how they would interpret certain things and use this information. Social network analysis is a powerful tool. When wielded appropriately and ethically, it can be incredibly illuminating to help us understand the contexts in which we work. Use these key design principles and you’re on the way to success.